The deadline for this competition is rapidly approaching. All entries must be received by 15-July-2010. Enter today for an opportunity to get your photographic talent recognized and rewarded! If you're active in our forums, even at a very modest rate, your membership term will increase, up to two solid months. Nikonians founders J. Ramón Palacios (jrp) and Bo Stahlbrandt (bgs) have announced the new Nikonians Dynamic Membership Program, which rewards active members by automatically adding extra days to their membership plan. The intent is to reward those who participate in the community, thereby enhancing the exchange of information and ideas, while showing appreciation for those members who are most active. This allows all active members to earn additional days which are automatically added to their membership term. Basic (the initial, free, limited term membership), as well as Silver, Gold and Platinum members can participate. For more information, check the announcement here. Tamron USA is hosting a feature-packed series of full day seminars with renknowned nature and fine-arts photographer Sandra Nykerk. Basic Editing Skills & Sandras Favorite "Stones"
The seminar tour kicks off July 13th in Seattle WA and makes it's way across the US to New York in August. Don't miss your chance to attend this exclusive educational seminar. Refreshments and snacks will be provided and there will be exclusive Tamron Offers and Door Prizes as well. All for the low cost of just USD59. 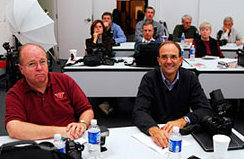 For more information and to reserve your seat, click on Tamron Events. A free firmware update is required to address the issue. No further details were provided by the notice. The affected unit serial numbers and a link to locating the nearest Sigma Photo repair facility are provided after the jump. The Associated Press brings word of a Nikon lost at sea, and found after an apparent stunning six month journey from Aruba to the coast of Florida. Be sure to check out the accompanying photos and video recovered from the camera. Adobe has released a second iteration of their Lens Profile Creator utility for use with Photoshop CS5, Lightroom 3 and Camera RAW 6.1. The utility corrects for three typical optical aberrations; geometric distortion, lateral CA and vignetting. A specific profile for your lenses can be created; discussion boards are available to share common profiles with the user community. Get your copy today at Adobe Labs. Jason and Rick got the chance to interview fellow Nikonian Alan "Dex" Poindexter, a NASA astronaut who commanded the recent STS-131 space shuttle mission to the International Space Station. Check out the photos that Dex brought back from his mission! Jason's new eBook, The Photographer's Guide to Digital Landscapes, has been released! Photo Prescription: Data Back-up strategies. Adobe has released Photoshop LightRoom 3; the latest iteration of the popular workflow tool gracing PC and Mac desktops. Thanks to a comprehensive public beta started in October of 2009, the program received the feedback of a large community of photographers and addressed many core issues from previous versions. Adobe Photoshop LightRoom 3 is available for purchase online now at https://www.adobe.com/store. The MSRP is USD299 with an upgrade price of USD99 for qualified owners of previous LightRoom versions. Annotate 1.30 is now available for download. Now supports tethered shooting, annotation of PDF and TIFF files and user definable colors during export. Several of the new features target architects and civil engineering, construction site audits and similar. The new version detects any older version installed and offers to remove it on first start. This may happen twice (after first two start ups) depending on which version previously was installed. On Windows 7 and Windows Vista the tethered shooting does not require any additional packages to be installed and works "out of the box". On Windows XP it requires the “WIA 2.0” (Windows Image Acquisition) to be installed to work. The WIA redistributable package is offered to be installed on the fly as soon as you start tethered shooting on Windows XP for the first time. 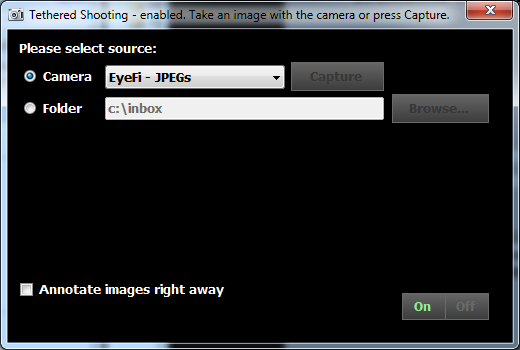 No matter which Windows version you are using, the camera must be in PTP mode. PDF support requires GhostScript to be installed. The application provides step by step guide to install GhostScript in case you open a PDF file for the first time. Note: You may be required to run Annotate as Administrator on Windows 7/Vista when the GhostScript dll needs to be registered. PDF documents version 1.4 and later can be opened in Annotate Expert. Earlier versions cannot be opened since they do not support the required XMP standard - which is used to store annotations into the file.